The survival of Israel, he said during a speech that traditionally is given on the Sabbath before Passover has “from time immemorial been dependent on the holy Torah. Malachi, the last Prophet, says in his final words that the Jewish people must 'remember the Torah of Moses my servant.' Even if prophecy has passed from the world, we are enjoined to remember and learn the Torah,” he said. 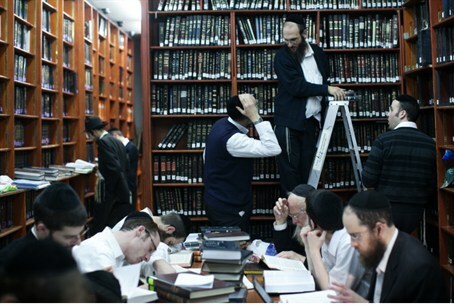 The movement to lessen support for Torah study is endangering the state, he said. “The Land of Israel is in danger. The sinners who seek to harm Torah study do not realize that they are endangering the existence of the land altogether. They are not hurting us, those who learn Torah, but themselves. Malachi, after warning us not to forget the Torah, warns us of the consequences if we do – do not forget the Torah, 'lest I devastate the Land.' Let those who seek to harm us be on notice that they may cause much damage to all around them, and to the Land they live in,” he said. Rabbi Vozner finished with his hope that those planning the budget cuts would “wake up and change their ways,” he added.